A monocot, short for monoctyledon, are flowering plants that have only one cotyledon. The orchid family is the largest within the monocot clade. Scientists believe that monocots evolved from dicots and thus dicots form a paraphyletic group. The name monocot comes from the botanical name, Monocotyledonae, and as the name suggests, it is an angiosperm (Angiospermae, flowering plants, or Magnoliophyta) with a seed that has a single cotyledon (embryonic leaf). There are many monocots belonging to different taxonomic ranks. 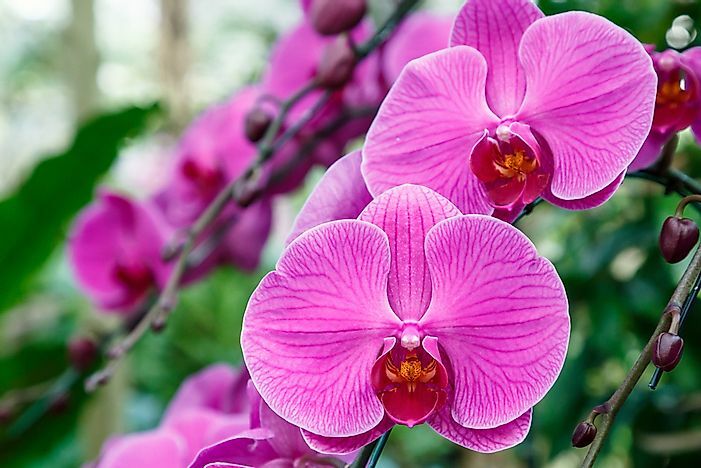 Within these ranks, the family Orchidae (Orchids) have the most number of species, at least 20,000. There are approximately 60,000 known species of monocotyledonous plants, half of which are Poaceae (true grass). Although diverse, there is a consensus when it comes to monocots because of their distinctive nature. Human beings use monocots in different areas including as food and production of energy making them beneficial and of economic importance. Apart from having a single embryonic leaf, monocots have general characteristics shared among the many species. First, most monocots are herbaceous with few being arboraceous. The herbaceous ones have no secondary growth ability (increase in width of a stem). They lack Cambium which allows plants to continuously grow in height and girth, therefore, they do not grow too much save for arboraceous monocots like bamboos, palms, and agaves. Their lack of cambium also brings about challenges in the transportation of water. Monocots have vascular tissues and bundles adapted to counter the lack of cambium and counter the shortage of water transportation, therefore, transporting water and nutrients up the plant. Another major characteristic is that monocots have major veins running parallel to each other in their leaves. These tissues are normally less at the center and more placed to the periphery in ring forms. This type of vascular arrangement is known as atactostele. Monocot flowers are trimerous, meaning that they have flowering parts in multiples of threes. This system makes parts like the petals and stamens to be either three, six, or nine. Monocot leaves are linear (parallel) or oblong, normally sheathed at the base. The primary root of monocots withers off after a short period, consequently giving way to adventitial fibrous or fleshy roots. Adventitial roots develop from different parts of the plant, like on the leaves and stems, other than the radicle. The pollen grains in monocots have a single aperture (pores or furrows) called a monocolpate or colpus. The non-reproductive part of monocot flowers, the perigone, consist of a set of two alternating trimerous whorls of tepalshaving the perianth not divided into calyx and corolla. In monocots whose pollination occur through the help of animals, zoophilous, the whorls form a petal-like shape called coralline. The period during which monocot flowers open, anthesis, is normally short, fugacious, although some perigones that are persistent in nature show thermonastic (temperature-controlled) opening and closing. Zoophilous monocots predominantly depend on insects and have showy or appealing flower parts like tepal whorls, filaments, staminodes or stylodia that attract insects. There are few examples of zoophilous monocots that have dull flowers (aphananthous) but still rely on animals for pollination. Aphananthous, therefore, rely on a chemical attraction like sweet fragrances or other parts like colored bracts that provide optical attraction. On most monocots, animals use the perigone as a landing pad.